This is an easy to build, but nevertheless very accurate and useful digital voltmeter. It has been designed as a panel meter and can be used in DC power supplies or anywhere else it is necessary to have an accurate indication of the voltage present. The circuit employs the ADC (Analogue to Digital Converter) I.C. CL7107 made by INTERSIL. This IC incorporates in a 40 pin case all the circuitry necessary to convert an analogue signal to digital and can drive a series of four seven segment LED displays directly. 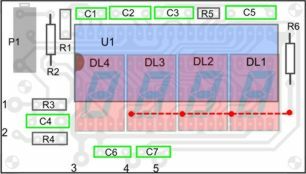 The circuits built into the IC are an analogue to digital converter, a comparator, a clock, a decoder and a seven segment LED display driver. The circuit as it is described here can display any DC voltage in the range of 0-1999 Volts. - Easy to read from a distance. - It is not affected by noise. - No need for a sample and hold circuit. - It has a built-in clock. - It has no need for high accuracy external components. An Analogue to Digital Converter, (ADC from now on) is better known as a dual slope converter or integrating converter. This type of converter is generally preferred over other types as it offers accuracy, simplicity in design and a relative indifference to noise which makes it very reliable. The operation of the circuit is better understood if it is described in two stages. During the first stage and for a given period the input voltage is integrated, and in the output of the integrator at the end of this period, there is a voltage which is directly proportional to the input voltage. At the end of the preset period the integrator is fed with an internal reference voltage and the output of the circuit is gradually reduced until it reaches the level of the zero reference voltage. This second phase is known as the negative slope period and its duration depends on the output of the integrator in the first period. As the duration of the first operation is fixed and the length of the second is variable it is possible to compare the two and this way the input voltage is in fact compared to the internal reference voltage and the result is coded and is send to the display. All this sounds quite easy but it is in fact a series of very complex operations which are all made by the ADC IC with the help of a few external components which are used to configure the circuit for the job. In detail the circuit works as follows. The voltage to be measured is applied across points 1 and 2 of the circuit and through the circuit R3, R4 and C4 is finally applied to pins 30 and 31 of the IC. These are the input of the IC as you can see from its diagram. (IN HIGH & IN LOW respectively). The resistor R1 together with C1 are used to set the frequency of the internal oscillator (clock) which is set at about 48 Hz. At this clock rate there are about three different readings per second. The capacitor C2 which is connected between pins 33 and 34 of the IC has been selected to compensate for the error caused by the internal reference voltage and also keeps the display steady. The capacitor C3 and the resistor R5 are together the circuit that does the integration of the input voltage and at the same time prevent any division of the input voltage making the circuit faster and more reliable as the possibility of error is greatly reduced. The capacitor C5 forces the instrument to display zero when there is no voltage at its input. The resistor R2 together with P1 are used to adjust the instrument during set-up so that it displays zero when the input is zero. The resistor R6 controls the current that is allowed to flow through the displays so that there is sufficient brightness with out damaging them. The IC as we have already mentioned above is capable to drive four common anode LED displays. The three rightmost displays are connected so that they can display all the numbers from 0 to 9 while the first from the left can only display the number 1 and when the voltage is negative the В«-В« sign. The whole circuit operates from a symmetrical СЃ 5 VDC supply which is applied at pins 1 (+5 V), 21 (0 V) and 26 (-5 V) of the IC. First of all let us consider a few basics in building electronic circuits on a printed circuit board. The board is made of a thin insulating material clad with a thin layer of conductive copper that is shaped in such a way as to form the necessary conductors between the various components of the circuit. The use of a properly designed printed circuit board is very desirable as it speeds construction up considerably and reduces the possibility of making errors. To protect the board during storage from oxidation and assure it gets to you in perfect condition the copper is tinned during manufacturing and covered with a special varnish that protects it from getting oxidised and also makes soldering easier. Soldering the components to the board is the only way to build your circuit and from the way you do it depends greatly your success or failure. This work is not very difficult and if you stick to a few rules you should have no problems. The soldering iron that you use must be light and its power should not exceed the 25 Watts. The tip should be fine and must be kept clean at all times. For this purpose come very handy specially made sponges that are kept wet and from time to time you can wipe the hot tip on them to remove all the residues that tend to accumulate on it. DO NOT use soldering flux apart from that which is already included in your solder. Too much flux can cause many problems and is one of the main causes of circuit malfunction. If nevertheless you have to use extra flux, as it is the case when you have to tin copper wires, clean it very thoroughly after you finish your work. - Clean the component leads with a small piece of emery paper. - Bend them at the correct distance from the componentвЂ™s body and insert the component in its place on the board. - When the solder starts to melt and flow wait till it covers evenly the area around the hole and the flux boils and gets out from underneath the solder. The whole operation should not take more than 5 seconds. Remove the iron and allow the solder to cool naturally without blowing on it or moving the component. If everything was done properly the surface of the joint must have a bright metallic finish and its edges should be smoothly ended on the component lead and the board track. If the solder looks dull, cracked, or has the shape of a blob then you have made a dry joint and you should remove the solder (with a pump, or a solder wick) and redo it. - When you finish your work, cut off the excess of the component leads and clean the board thoroughly with a suitable solvent to remove all flux residues that may still remain on it. First of all the display ICвЂ™s are placed from the copper side of the board and second the jumper connection which is marked by a dashed line on the component side at the same place where the displays are located is not a single jumper but it should be changed according to the use of the instrument. This jumper is used to control the decimal point of the display. If you are going to use the instrument for only one range you can make the jumper connection between the rightmost hole on the board and the one corresponding to the desired position for the decimal point for your particular application. If you are planning to use the voltmeter in different ranges you should use a single pole three position switch to shift the decimal point to the correct place for the range of measurement selected. (This switch could preferably be combined with the switch that is used to actually change the sensitivity of the instrument). Apart from this consideration, and the fact that the small size of the board and the great number of joints on it which calls for a very fine tipped soldering iron, the construction of the project is very straightforward. Insert the IC socket and solder it in place, solder the pins, continue with the resistors the capacitors and the multi-turn trimmer P1. Turn the board over and very carefully solder the display ICвЂ™s from the copper side of the board. Remember to inspect the joints of the base of the IC as one row will be covered by the displays and will be impossible to see any mistake that you may have made after you have soldered the displays into place. The value of R3 controls in fact the range of measurement of the voltmeter and if you provide for some means to switch different resistors in its place you can use the instrument over a range of voltages. When you have finished all the soldering on the board and you are sure that everything is OK you can insert the IC in its place. The IC is CMOS and is very sensitive to static electricity. It comes wrapped in aluminium foil to protect it from static discharges and it should be handled with great care to avoid damaging it. Try to avoid touching its pins with your hands and keep the circuit and your body at ground potential when you insert it in its place. Connect the circuit to a suitable power supply СЃ 5 VDC and turn the supply on. The displays should light immediately and should form a number. Short circuit the input (0 V) and adjust the trimmer P1 until the display indicates exactly В«0В». Check again all the external connections to and from the circuit to see if there is a mistake there. - Check your project for faulty or damaged components. Hi. I want to get the voltage reading as serial data that could be read by my microcontroller. Please suggest me some idea. Thank you. U got the Absolute Zero conductor and the integration conductor mixed up. C5 is your integration conductor and C3 is the absolute zero conductor. The clock is set at 48kHz, not 48Hz. I've constructed the circuit. The problem I encountered is that the reading change quite often with difference of -0.6 to 0.6 from actual voltage. I've changed the 47nF to 470nF, based on the datasheet of ICL7107. it change less often, and only @ ~0.2 difference. maybe because of my capacitors as well. I've used 47nF Ceramic, and changed to 470nF Mylar.